Last night being the last Friday of March, there was a meeting at my place, as already flagged up here. But it was also Good Friday, so I did a bit of extra hustling and emailing around beforehand to ensure some kind of turnout. It worked. Great talk, and there were nine libertarian-inclined Londoners present in the form of: two Americans, a German, a Frenchman, a Spaniard, a New Zealander and three Englishmen. Those are two of the three Englishmen who were present, the other being me. On the right there is speaker for the evening Richard Carey, and on the left Simon Gibbs, both of Libertarian Home fame. Gibbs was not rudely ignoring the conversation and catching up on his emails; he was looking up names and titles that were being mentioned in the conversation. 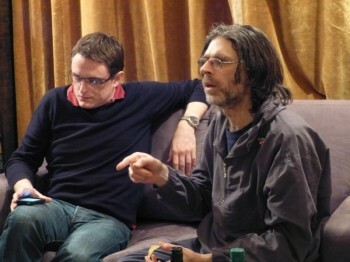 I particularly like the potato crisp in Carey’s left hand at the very bottom of the picture. The talk was everything that I personally was hoping for. There was lots of biographical detail of who the key early Austrians were (Menger, Böhm-Bawerk, Wieser) and what kind of intellectual context they were operating in and what they said. And then the same for the later figures of note (von Mises, Rothbard). Other twentieth century figures were mentioned. Given how admiringly Carey spoke about him, I was particularly intrigued by Frank Fetter, only a name to me until now. Carey made no attempt to disguise the fact that he is a recent arrival to the task of getting his head round Austrian Economics, which for me was a feature rather than a bug, just as I thought it would be. And he made no attempt to suggest that he understood more than he actually did about the subject. His talk entirely lacked that sub-agenda that you so often sense with some speakers, that half the point of telling the story is to tell the story, but the other half of the point is to prove how very clever and well informed the speaker is, more so than he actually is. That Carey had no time for such nonsense only made me admire his intellect all the more. I had been expecting that the abstract theorising about what it all meant, what the intellectual guts of it all consisted of, would come at the end. The economic way of getting stuff versus the political way, trade versus stealing, individualism versus collectivism, the subjectivity of value, and so forth. Actually that bit came, at some length, at the beginning, so much so that I at first feared that all that biographical detail that I had been so looking forward to would be somewhat skated over. But all ended well, and I learned a great deal. I did not record this talk in any way. However, Simon Gibbs, the man on the left in the picture above, has already invited Richard Carey to do a repeat performance of this talk for Libertarian Home, and a video camera will presumably then be running. Meanwhile, I am very happy for Carey to have given this talk a first outing in friendly surroundings, and for him to get some early feedback on it. I find that I am making a point of getting speakers to speak about things they’ve not spoken about before, but will undoubtedly be speaking about again, for just these sorts of reasons. Two books were mentioned in the course of the discussion afterwards that I intend to investigate further. Christian Michel mentioned this collection of lectures by Michel Foucault, in one of which he apparently said something embarrassingly (given the kind of people who were listening) nice about the free market as the only place where freedom actually happens, or some such surprising thing. I’ve already emailed Christian asking for chapter and verse of the quote in question. And second, Aiden Gregg (who is an academic psychologist and who has already been fixed to speak at a later one of these meetings) mentioned the writings of somebody called Larken Rose, a new name to me, and in particular this book, which appears to cover similar ground, albeit in a somewhat different style, to that discussed in Michael Huemer’s The Problem of Political Authority, which has been written about here recently. Evenings like this don’t have any immediate world-changing impact, but every little helps. Brian, I will likely be visiting London during the last week in July and would like to attend on of your Brian’s Fridays if possible. Please contact me via my email so we can see if we can work this out. I wish I had been at this meeting. Still I am comming down to London next weekend and so I should have a chance to listen to some things. Brian, thank you for your kind words above and for setting me the task in the first place. I would have liked it to be a bit more ordered, but it is a big subject, and I’m somewhat prone to taking tangents!